"Boy, is he one cute shopping cart!" "Go ahead. Talk to him." "If only I had a few drinks in me first ..."
"You silly, we're shopping carts. We don't eat or drink." "Oh yeah, you're right. Okay, I'll try." "He can't be Jewish. Look at the size of his basket!" I knew those shopping carts could talk. 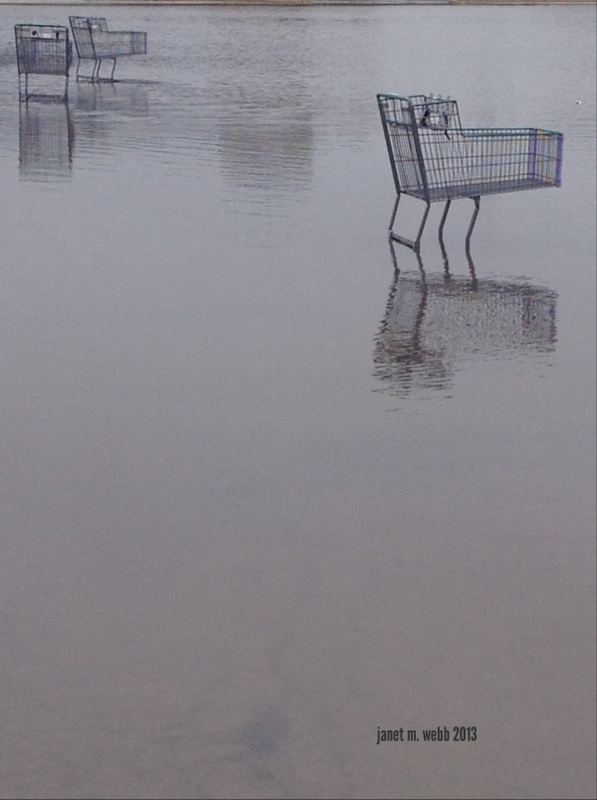 Imagine what they say about us when we don't return them to the cart return area when it's raining hard! The other Friday Fictioneers may not write about shopping carts talking, may have them drinking and eating, or may even have them standing indignantly at the Kosher Meat Section complaining to the fellow in the yarmulke there "Mr. Rosenblatt, these rib steaks were terrible!" Click here to find out. I'm sorry that of late I've had so little time to read the stories of the other Fictioneers, but life circumstances intervene. I hope to get back to it soon. In the meantime, my shopping carts and I love what you're writing, Kosher or not. :) I'm sure the goy oops guy is worth getting to know. Good one. If your shopping carts wish sincerely to keep their thoughts and words confidential, tell them to visit my blog. Was that an excuse to make for shyness? Very funny though! Does one need two carts? One for milchik and one for flayshdik? We didn't grow up keeping Kosher so I'm a little foggy on how to shop. Oh my, how you make me laugh! Thank you, Perry!